The Ocean Wave quilt is a favorite for one who is willing to put considerable piecing into making a lovely quilt. 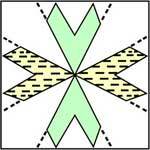 A quilt block is made of four six-sided units of 24 triangles, all made exactly alike, but set together so that the groupings of dark and light triangles alternate as shown in the small sketch. 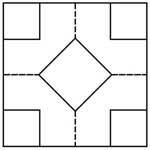 Four of these six-sided units are put together as shown in the pattern finish into a block 18 inches square. 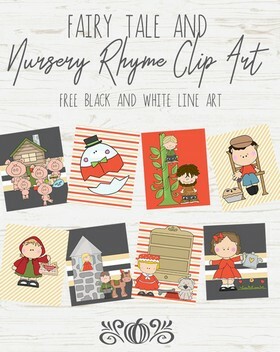 These may be put together with alternate 18-inch white blocks quilted in matching pattern. Or, for the really old-time pattern of an Ocean Wave, omit the 4 large white corner triangles. 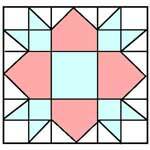 Join the eight-sided quilt blocks where the large triangles are shown in the pattern, with 6-inch white squares to fill in the center spaces between the blocks. 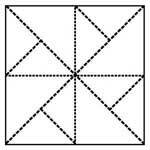 Put the top together in such a way that all six-inch squares will set diagonally on the quilt. 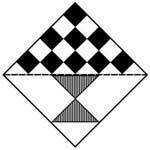 This will makean overlapping design similar to the double wedding ring. 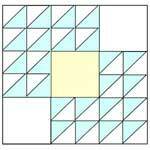 Four blocks wide, with center squares diagonally placed make a top row. 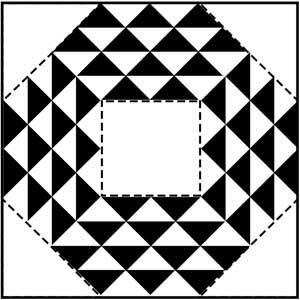 An identical four make a second row, but there will appear to be three intermediate blocks with two halves at the sides between these first and second rows. Fabric Estimate: In making this Ocean Wave quilt, 4 blocks wide by 4 1/2 blocks long, it will measure about 72 by 81 inches when finished. 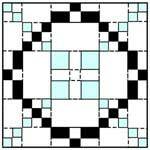 The quilt requires 16 whole pieced blocks, without the four corner triangles and 4 half blocks set together with 6-inch squares and half squares cut diagonally. Fabric required is 3 1/2 yards of print, 5 1/2 yards white fabric. Allow extra for seams on allblocks. 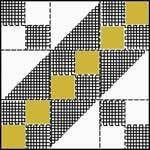 Click on image to print the 5" block of the Ocean Wave Quilt Block Pattern.